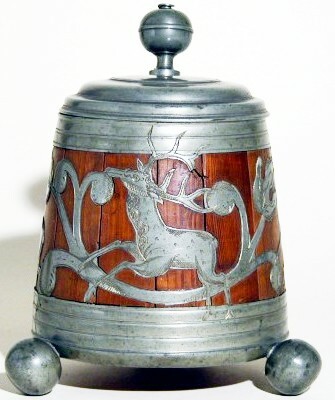 There are way too many variables: condition, location, time of year, present trends in stein collecting, local (and now national) economics, never seen before (therefore no comparables); but most of all = prior expectations by the owner, are among the reasons! I have for over a year now placed these three short “notifications” at the bottom of each page. It is now obvious to me the general public never gets that far before wanting to ask me a question on beer stein dollar values. So I have had to move them forward as I am getting tired of copying them and sending them back to people as an answer to their “stein value?” questions. This was meant to be an informational web site only. 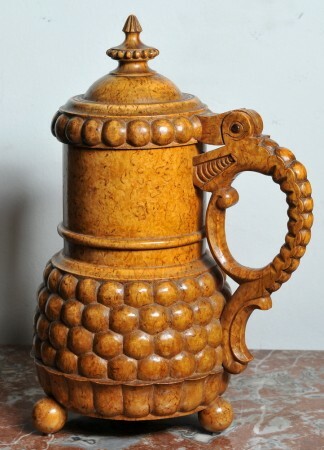 Almost all of these type (beaked) wooden steins were produced in Bavaria in the area around Munich, mainly in the time frame of 1850 to 1920. 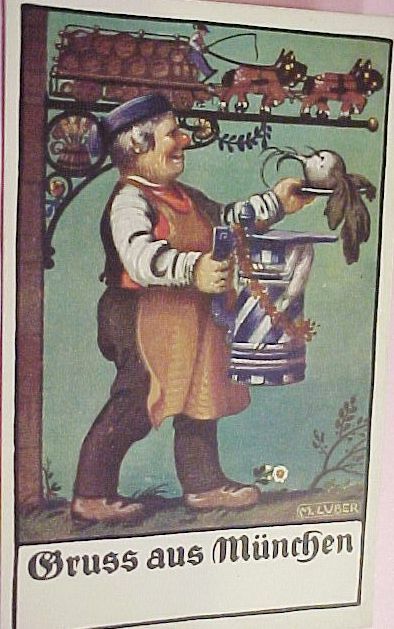 A copy of an old Munich postcard showing “The Maid” on a barrel, reading a paper with a wooden tankard, almost identical to the one above, just below her. 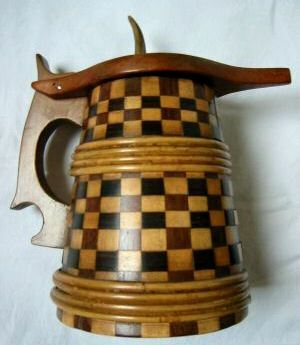 A hard to make checker board pattern ‘beaked lid’ wooden stein. Circa 1920. ▲ ▲A V & B, Mettlach stein, No. 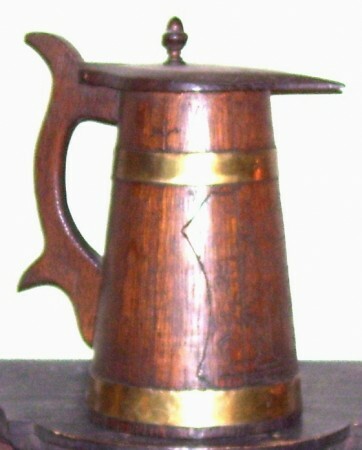 1947 showing a beaked wooden stein to the lower right of the scene, and about as tall as the one shown just below. ▲ ▲This example is more professionally made. 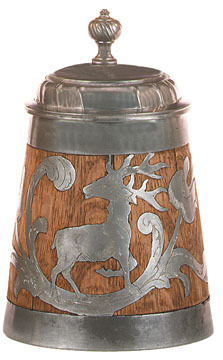 BEAKED STEIN WOODEN STEIN – LID FROM PEWTERER J. LICHTINGER, MUNICH. 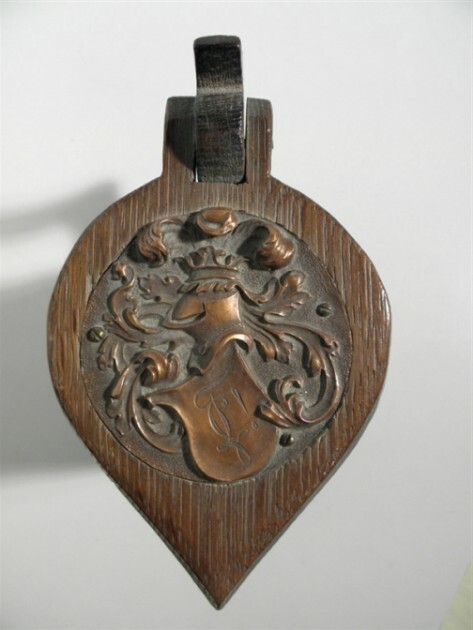 BEAKED WOODEN DUELING STUDENT STEIN lid , UNUSUAL BEAKED WOODEN STEIN WITH BRASS-STUDENT SYMBOL ( ZIERKEL) On shield. same body as first on this page. 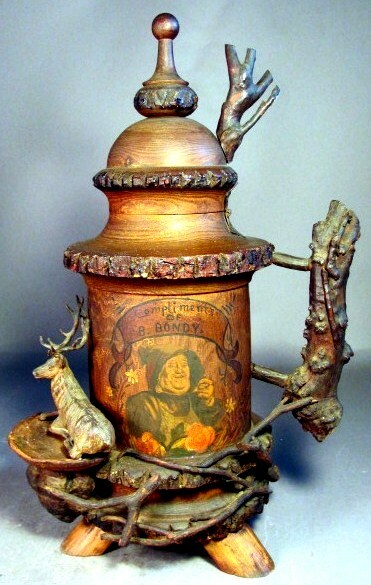 A “TRAMP ART” STEIN – About a one liter German “Tramp Art” stein. This would have to rate at a least as a “7” on the Smith-Parator Rarity scale. But please remember just because something is rare doesn’t make it valuable! I do believe this is the only one I have seen in 42 years of collecting. Given how thin the handle is, I am not at all certain. 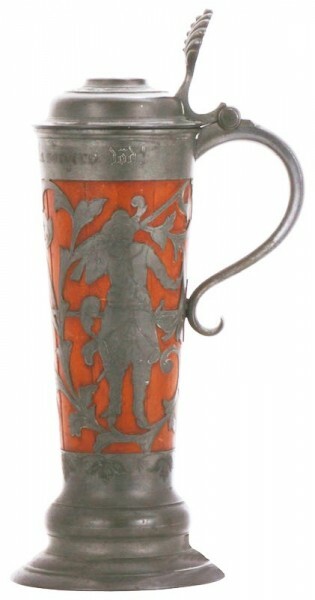 that this stein was made for use. Perhaps it was ……but I think a display stein would be more likely its fate. Detail of the “Tramp Art” carving ~ not as easy as it looks. 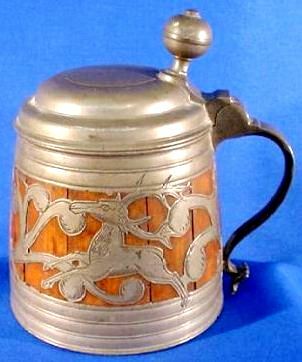 What appears at first glace to be a Bavarian beaked lid stein is not. 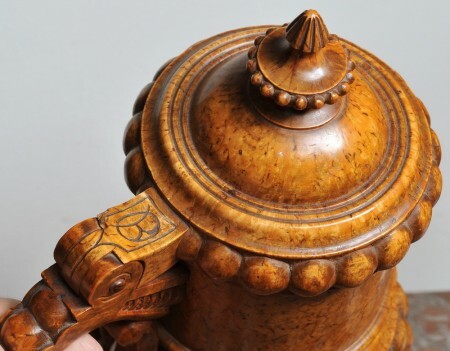 This is very unusual “chip carved” Norwegian [I believe [or Dutch] “creation” . I just had to included it for my reader’s pleasure. It is so unusual, I do wish this one was in the SM & T! 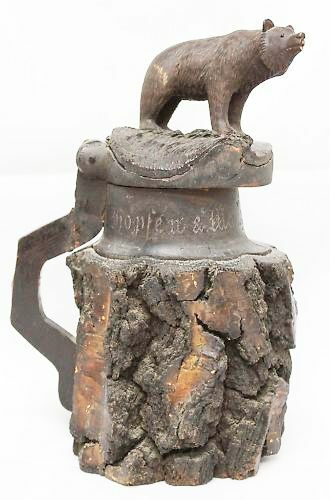 A very unusual,(and scarce) “Black Forest Hunting” type hand carved beer stein. 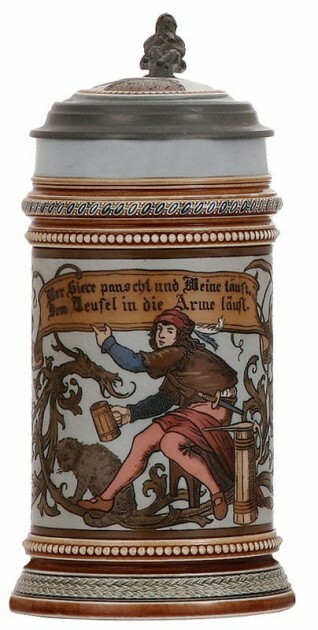 9.5 inches with a carved verse: “Hopfen & Malz./ Gott erhalt’s” (Hops and Malt – God preserve them.) Probably made more for display than use. 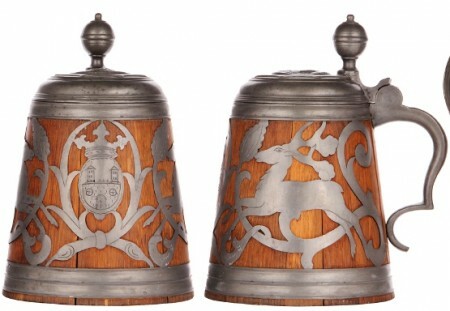 This pair of 18.5 inch hand made wooden steins was recently on eBay. No one knows who B. Bondy was! Above ▲: Two “newer” versions of Thuringian Daubenkrug, both about .75 liters. Made in the mid to late 1800’s. 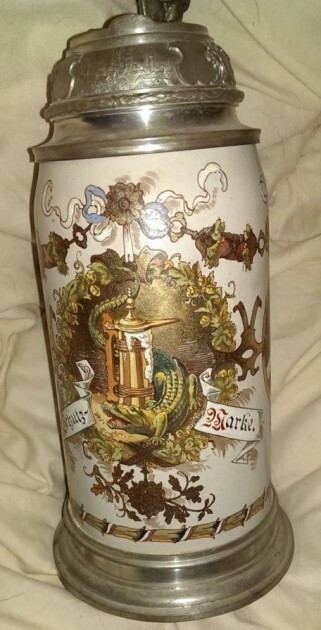 A .5 liter Daubenkrug , Ca 1880. 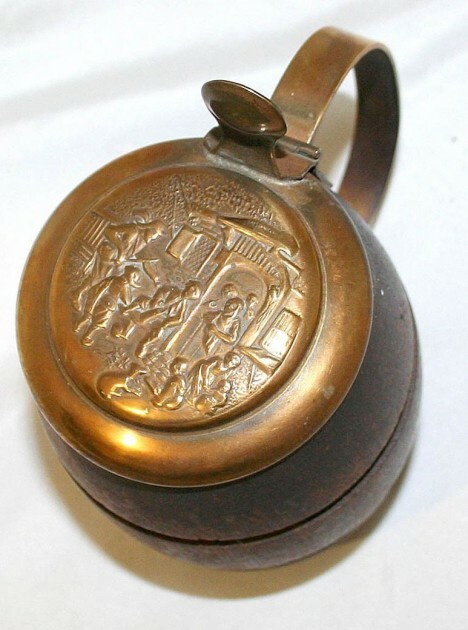 This one is stamp marked: “J SEESTALLER,” underside of lid,. Unknown pewtersmith location or history at this time (No info about him in Stein Marks either). So where or what is Thuringia? (as in Thurigian Daubenkrug?) The THURINGIAN FOREST (Thiiringerwald), is a range of hills in Germany, extending in an irregular line from the neighborhood of Eisenach in the N.W. to the Lobensteiner Kulm on the Bavarian frontier on the S.E. On the S.E. It is continued directly by the Frankenwald Mountains to the Fichtelgebirge, while on the N.E. it approaches the Harz Mountains, and thus takes its place in the great Sudeticchain of central Germany. 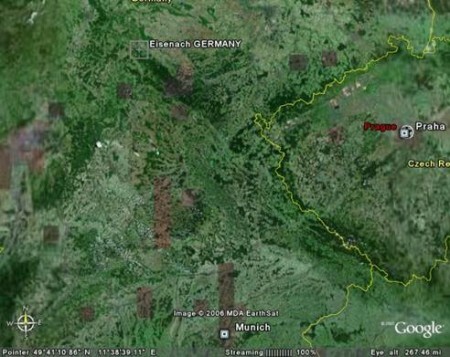 The length of the Thuringian chain is 70 m., and its breadth varies from 6 to 22 m. It nowhere rises into peaks, and only a few of its rounded summits reach 300×5 ft. The successive hills form a continuous comb; the north-west slopes are precipitous and seamed with winding gorges. THE FOREST IS THE HEAVY AREA IN GREEN (THE DARKER AREA IN BLACK AND WHITE) TO THE S.E. OF EISENBACH RUNNING ALMOST TO THE CZECH BORDER. This range encloses many charming valleys and glens; the most prominent feature of its scenery is formed by the forests, chiefly of pines and firs. The north-west part of the system is the loftier and the more densely wooded as well as the more beautiful; the highest summits here are the Grosser Beerberg (3225 ft.), Schneekopf (3203) and the Finsterberg (3104), all in the duchy of Gotha. 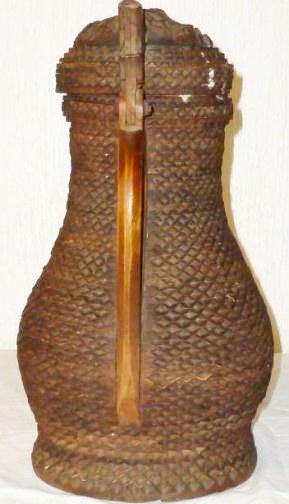 A Thurigian Daubenkrug. 5 inches tall. 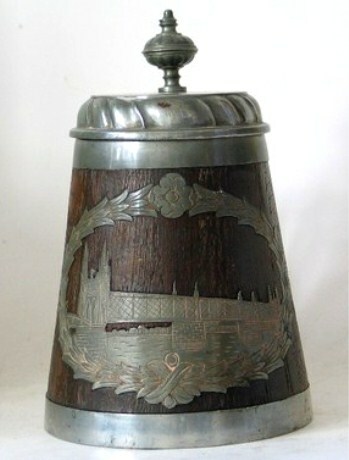 Circa 1780; with a very distinguishable handle end finial, usually in shield form. A rare Arthurian Daubenkrug with 3 ball feet. Germany. 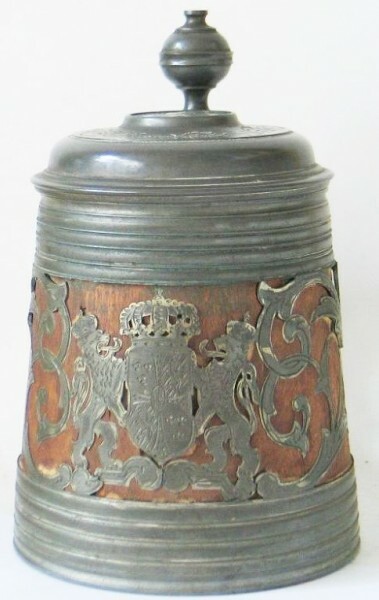 Circa 1750. 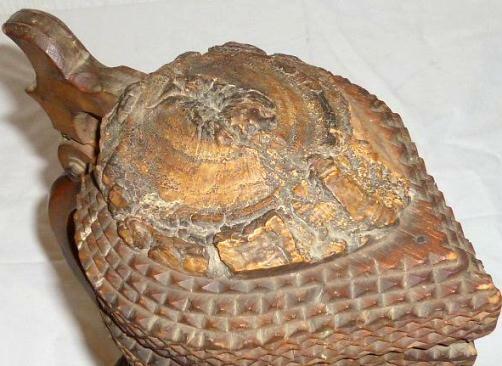 I have only seen this one with the feet in 41 years of collecting. See: “Compendium – “B ” for other Bustle Ladies. 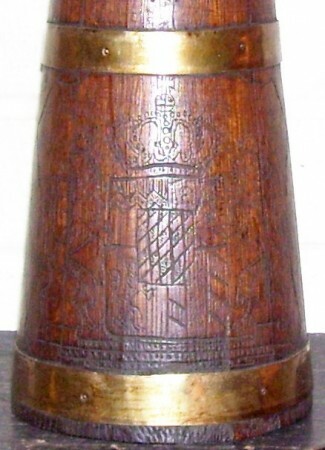 Dutch wooden stein, barrel form, with a thin stamped brass lid, made very much like the Dutch wall plaques that celebrate drinking in the their taverns. ▼ ▼ Ca. 1870. 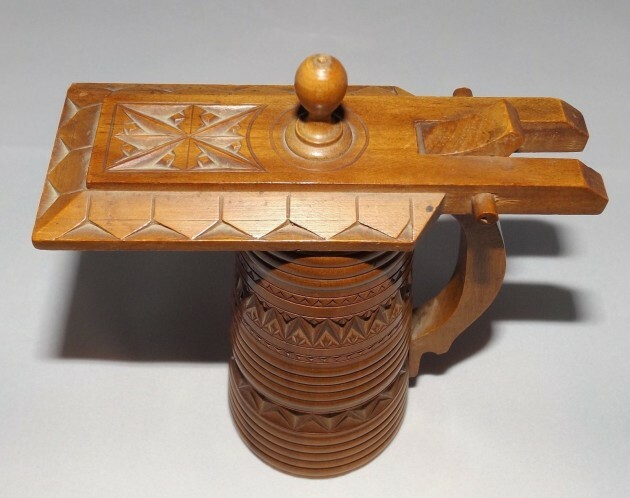 While made to look like a stein I think it had to have another function as the lip is too thick to be useful in drinking beer. 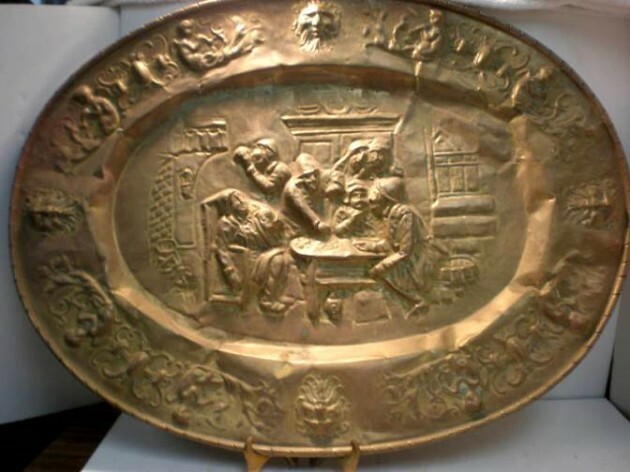 ▲ Dutch stamped brass wall charger [go with] — 21 in by 11 in. 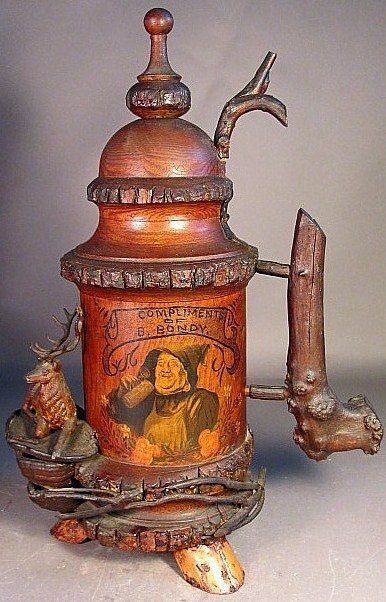 This is older than the stein above. 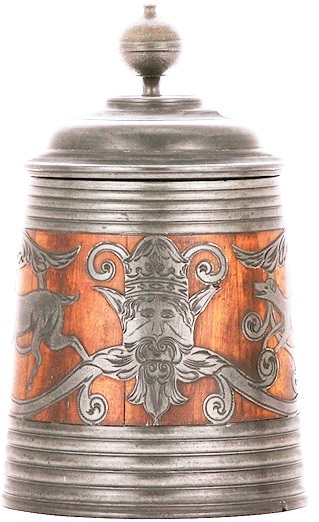 An extremely well done Scandinavian / Baltic States wooden stein notice the second ball in his mouth [!] . Ca. 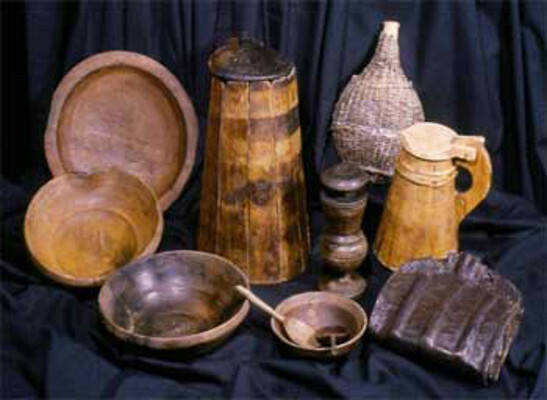 1700’s. 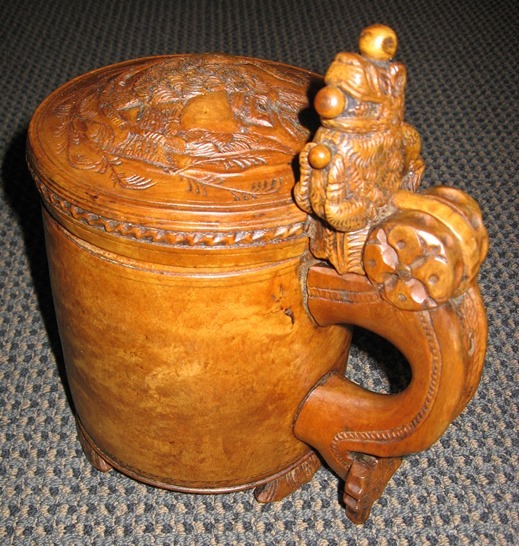 A very nice, latched finished, 13 inch tall Scandinavian / Baltic States wooden stein with folk dragon as the handle. 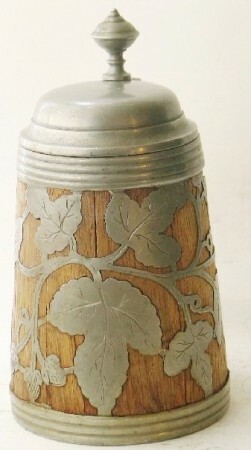 Circa 1820 -50. 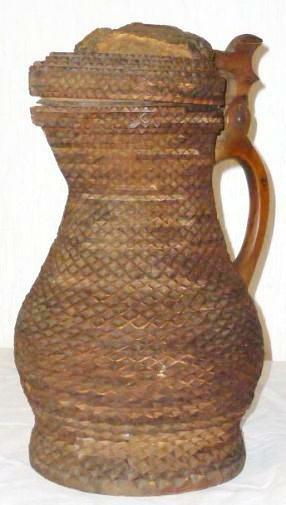 ▼ ▼ Just a short note about an old wooden vessel that well might have been a stein some 400 years ago. 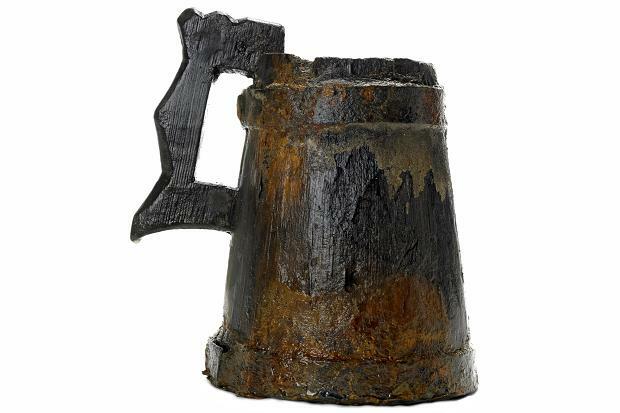 Drinking habits in Shakespearean England may have led to some filthy hangovers, judging by The very large volume wooden tankard found preserved in the mud of the River Thames. 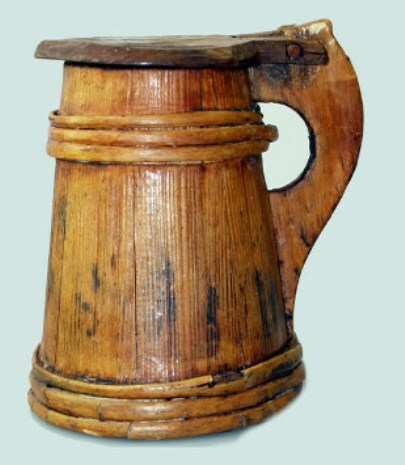 A wooden tankard marked with the initials RH, pulled from the river bed in East London, can hold three pints, suggesting that its owner would routinely consume large quantities of beer in a single sitting. 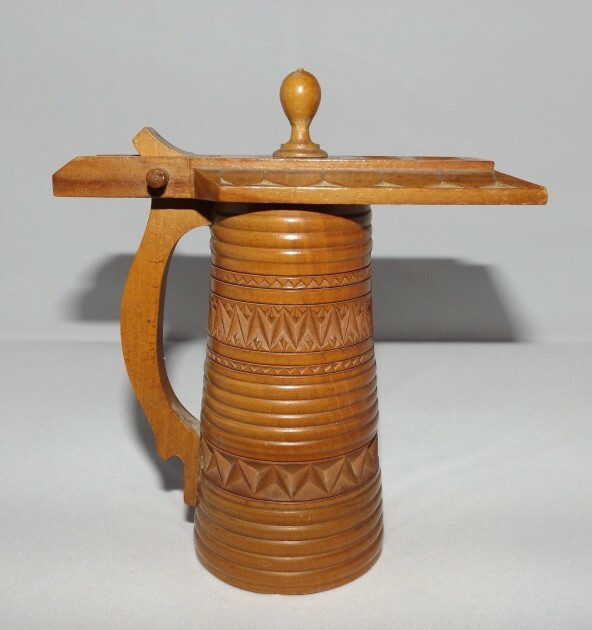 **** [Editor;s note: given that handle design, it ▲ well might have had a wooden lid attached (otherwise there is no reason for the top of the handle to extend pass the rin of the mug!) 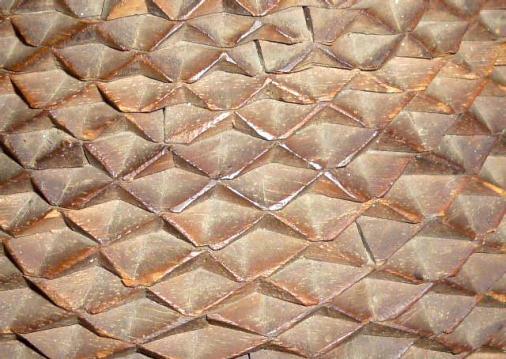 In fact there were many different styles and in better shape found in the ship ” Mary Rose” salvaged from the Thames. Please go to page three of “But will they float” for more.